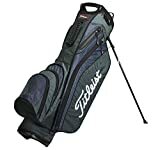 Titleist Single Strap Stand Bag is ideal for caddie clubs or for players who prefer the single strap carry system vs. the 4-point backpack system. The bag features 3-way top with full length dividers, 6 total pockets including two apparel pockets, two ball pockets, insulated beverage pocket, large velour-lined valuables pocket, umbrella strap and much more. Sturdy leg mechanism keeps the bag upright while helping to prevent slipping and sliding.